The phrase binary options trading have become synonymous to betting on Forex pairs. However, invariably all the binary options brokers offer diversified assets to trade with. These include commodities, stocks and indices. While stocks and indices may not look as attractive as Forex pairs, still, there is no lack of potential. A professional trader knows for sure that all markets are inter-linked some way or the other. Thus, two assets, which are traded in different markets, may share a direct or inverse relationship between them. This automatically opens up buying/selling opportunities in some other least tracked market without much of an effort. An index is one such derivative instrument, which can be traded successfully as long as a trader has good understanding of the components or underlying stocks which make it up. The stocks which are constituents of an index are usually the leaders in their respective sectors. Thus, it can be understood that an index provides the overall picture of a country’s economy. If a technically proficient trader has enough knowledge to interpret the effect of a strong or weak currency on the economy and on a particular sector as such then trading stocks and indices may not be too difficult. Why should one trade indices? It is not unnatural to think the need to trade index options when all binary options brokers provide a long list of FX pairs to trade with. A trader should be in a position to capitalize on all opportunities that come across. Moreover, trading index enables a trader to understand the strength and weakness of individual stocks. 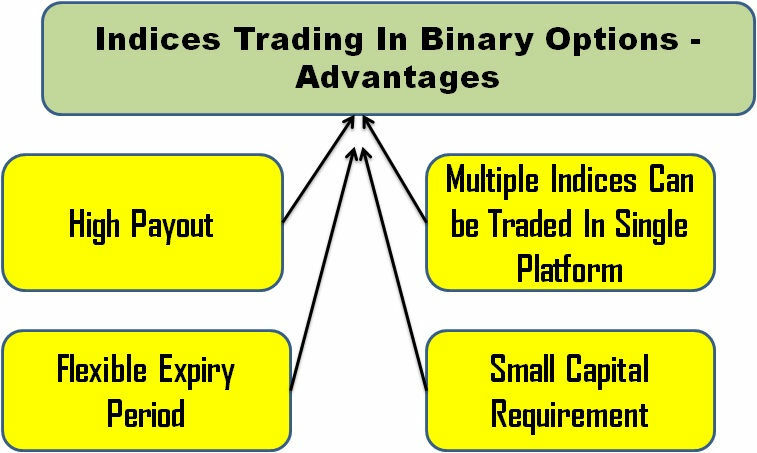 Since binary brokers also allow trading options with stocks as underlying asset, as a trader gains experience, new strategies can be created to realize consistent returns. The leading economic indicators affect indices as much as it affects the currency pairs. Additionally, there are plenty of television channels, which provide real-time news updates and reliable forecasts of indices. More importantly, the indices are less prone to spikes. Thus, support/resistance levels generally work well thereby increasing the probability of success. All these facts are compelling enough to trade index based binary options. Dow Jones Industrial Average (DJIA) – It is the most watched index in the world. The DJIA is a price-weighted average of 30 individual stocks listed in the New York Stock Exchange (NYSE) and NASDAQ. Nasdaq Composite – It is the major index of the tech heavy NASDAQ stock market. The index comprises of large non-financial companies (domestic and international) listed (3000+) in the exchange. S&P 500 – The S&P 500, an acronym for Standard & Poor’s 500, is an American stock market index and is made up of stocks of 500 large corporations listed in the NYSE and NASDAQ. CAC 40 – The benchmark stock market index of France is referred to as CAC 40. It is made up of 40 large (market capitalization) stocks listed in the CAC (Cotation Assistée en Continu) exchange. DAX – The DAX (Deutscher Aktienindex) is a German blue chip stocks index and is made up of 30 large German companies traded on the Frankfurt Exchange. FTSE 100 – The Financial Times and Stock Exchange 100 index includes 100 large British companies which are traded on the London Stock Exchange. It is one of the world’s most monitored stock exchanges. Hang Seng – The Hang Seng is a Hong Kong based market capitalization-weighted stock market index. This Asian index consists of 48 companies representing 60% of the market capitalization of the exchange. Dubai – The Dubai Financial Market General Index (DFMGI) is also a free-float market-capitalization weighted price index with base value of 1000 as on Januar, 2004. The index consists of stocks listed in the exchange. Tel Aviv 25 – It is the index of the Tel Aviv Stock Exchange (TASE). This market capitalization weighted index is made up of 25 free-floated (& adjusted) stocks. Bombay Stock Exchange (BSE) – It is the major stock exchange of India and the oldest in South Asia. The BSE index is made up of 100 large stocks (free-float) listed in the exchange. The stock exchange is also one of the fastest exchanges (less than 200 microseconds execution time) in the world. IBEX 35 — It is the benchmark index of the Bolsa de Madrid, Spain’s principal stock exchange. The index is made up of 35 most liquid securities traded on the Spanish Continuous Market. NIKKEI 225 — It is the most watched price-weighted index of the Japanese stocks and considered to be equivalent to the Dow Jones index. It is made up of 225 blue-chip stocks listed in the Tokyo Stock Exchange. Shanghai Stock Exchange Top 180 (SSE 180) — It is the major benchmark index reflecting the Shanghai market. The index consists of 180 A-share stocks and is the most representative of the Shanghai Stock Exchange. It was created after restructuring and renaming the SSE 30 index. Straits Times (STI) — It is the capitalization weighted benchmark index of the Singapore exchange. The index tracks the performance of the top 30 companies listed in the exchange. The index calculations are jointly performed by the Singapore Press Holdings (SPH), Singapore Exchange (SGX) and FTSE Group (FTSE). Other indices offered by selective group of brokers include Tokyo Stock Price Index (TOPIX), TADAWUL (Saudi Arabia), Russian Trading System Index (RTS — Russia), Moscow Interbank Exchange (MICEX 10 — Russia), Muscat Securities Market (Oman), Kuwait General Index (Kuwait), Kuala Lumpur Composite Index (KL Future – Malaysia), Istanbul Stock Exchange (ISE-30 – Turkey), NIFTY Futures (National Stock Exchange, India), Jakarta SE (Indonesia), Bovespa-F (Brazil), ASX Futures (Australia), Kospi (S.Korea), OMX Nordic 40 (Pan-regional – Nordic countries) and Swiss Market Index future (Switzerland). Similar to currency pairs, a binary options broker allows different kinds of index options trades. These include high/low (or up/down), One touch, and Long-term trades. The expiry period ranges from fifteen minutes to one month. The average of the bid and ask price is used as the expiry price. The indices cannot be traded during weekends. Additionally, the binary options trading platform will indicate the time at which a particular index can be traded. The returns vary from 70% to 400% depending on the nature (high/low, one touch etc.,) of trade. Additionally, a trader should have broad idea as to which economy is struggling or booming. Moreover, there are times when particular news overshadows another. In such a situation, a trader should be able to segregate the news with high impact. A trader should also regularly track the earnings forecasts from analysts to assess the index trend. High payout in comparison to traditional options. Multiple indices can be traded through a single binary options broker. Small investment is sufficient to begin trading. A trader should be proficient in both technical and fundamental analysis to succeed in index options trading. Need regular monitoring of the major markets.